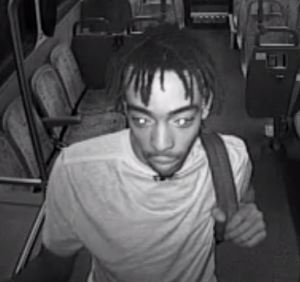 Montgomery County police are asking the public to help identify the suspect in a brutal assault that left a Ride On bus driver hospitalized on July 11. 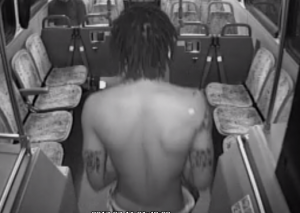 Police say the suspect got into a verbal argument with the driver as the bus got underway from the Shady Grove Metro station around 1:00 AM that morning. The suspect then began to physically assault the driver, who attempted to call the police as he was being attacked. 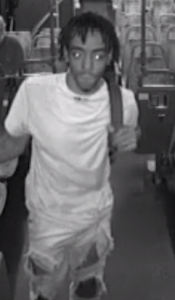 He did not stop his assault until the driver stopped the bus and opened the doors in the 15900 block of Frederick Road. The suspect got away on a bike he had brought with him on the bus. Anyone who recognizes the suspect, or who has information about this assault, is urged to contact the 1st District Investigative Section at 240-773-6084. For those who wish to remain anonymous, Crime Solvers of Montgomery County is offering a reward of up to $10,000 for any information that leads to the arrest of the suspect. Tipsters can call Crime Solvers of Montgomery County toll-free at 1-866-411-TIPS (8477).